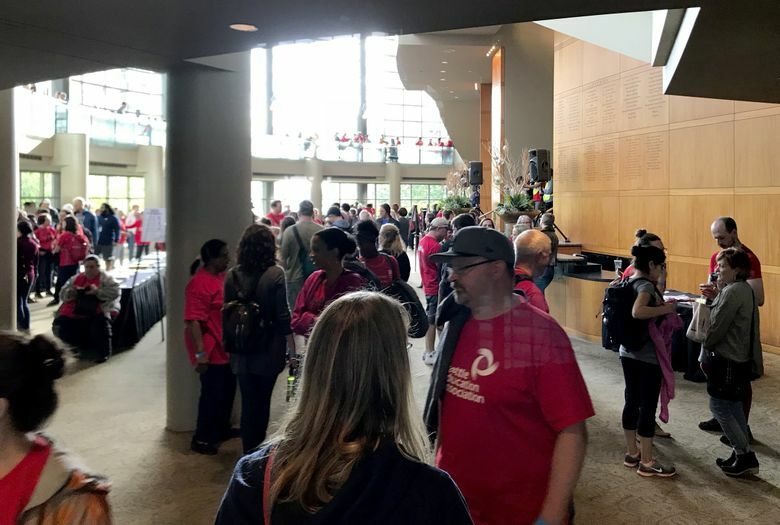 The one-year contract gives the 6,000 members of the Seattle Education Association an across-the-board 10.5 percent pay hike and for the first time provides them with five days of paid parental leave. In other parts of the state, including Puyallup and Tacoma, teachers continue to strike in their fight for better pay. Teachers and school staff in Seattle voted overwhelmingly late Saturday afternoon to approve a new contract between their union and Seattle Public Schools. The one-year contract gives the 6,000 members of the Seattle Education Association, which represents classroom teachers, substitutes, paraprofessionals and office professionals, an across-the-board 10.5 percent pay hike and for the first time provides them with five days of paid parental leave. To finalize the deal, the School Board on Tuesday, Sept. 18, will evaluate and vote on the contract. Compared to the number of union members who showed up to a late August vote to authorize a strike if a deal wasn’t reached by Sept. 5, the crowd Saturday was much smaller. At first, the union had to stall its vote on the proposed contract after there were too few members for a quorum. Some teachers and paraprofessionals walking into the meeting expressed mixed feelings on the proposal. “I’m OK with it because most jobs won’t give you a 10 percent raise, even though we’re still underpaid,” said Denise Sebastian, a paraprofessional who works with special-needs students at Denny Middle School. According to the union, 97 percent of office staff and 90 percent of paraprofessionals voted in favor of the contract; favorability slipped among teachers, however, who voted 83 percent in support. The union’s approval of the deal — which averted a walkout in the state’s largest school district — brings Washington one step closer to the end of a tense, chaotic season of teacher contract talks. In other parts of the state, including Tacoma, teachers continue to strike in their fight for better pay. But even as the school year ramps up under the new agreement, Seattle schools face financial uncertainty — and it’s unclear how sustainable the new contract is. The state Legislature this year injected about $1 billion into the state’s K-12 budget to pay for educators’ salaries and to settle the decadelong school-finance case known as McCleary. That infusion of cash will contribute to a one-time surplus of about $45 million in Seattle, which the district will tap to cover the 10.5 percent raises included in the proposed contract. The district also will rely on voters next year to renew its maintenance and operations levy, which accounts for about 15 percent of the district’s total revenue. “If the (maintenance and operations) levy isn’t renewed, we won’t be able to make it,” JoLynn Berge, assistant superintendent of business and finance, said Tuesday. Cynthia Nkeze, a literacy teacher at the Seattle World School, said it’s unwise to count on taxpayers to save the district’s finances. She voted against the contract Saturday, saying the union should have asked for more money now before voters mark their ballots in February. After Saturday’s vote, some educators pledged to march in Olympia next year, hoping to attract teachers from other districts who could convince the Legislature to provide more money for schools. But if that doesn’t happen, Phyllis Campano, head of the Seattle teachers union, warned there could be layoffs at the end of the school year. Paying for the raises will add to the district’s already negative financial projections: This summer Superintendent Denise Juneau sounded the alarm on years of projected budget shortfalls. “Eighty-five percent of our money goes to staffing, so if we don’t have that money, that’s where it has to come,” Juneau said in early August. Under the proposed contract, the starting pay for Seattle teachers will reach nearly $57,000, up from about $51,500 last school year. The maximum salary will now top $111,300 compared with $100,800 in 2017-18. If the School Board approves the deal, the average salary for all Seattle teachers will rise from about $68,000 in 2014 to $86,300 this year — a 30 percent increase over five years. Before Saturday’s vote, substitute teacher Toby de Luca tried to persuade his fellow educators to vote against the contract, which reduced the amount of days — from 60 to 45 — that a substitute had to work in the same classroom before they could access health benefits. “The contract provides the bare minimum — which is still slightly pathetic — compensation, but I still won’t have health insurance,” said de Luca, who has taught in the district for seven years. Correction: This story, originally published Sept. 8, 2018, has been corrected to include the date for the Seattle School Board’s vote on the proposed contract. Staff reporter Dahlia Bazzaz contributed to this report.